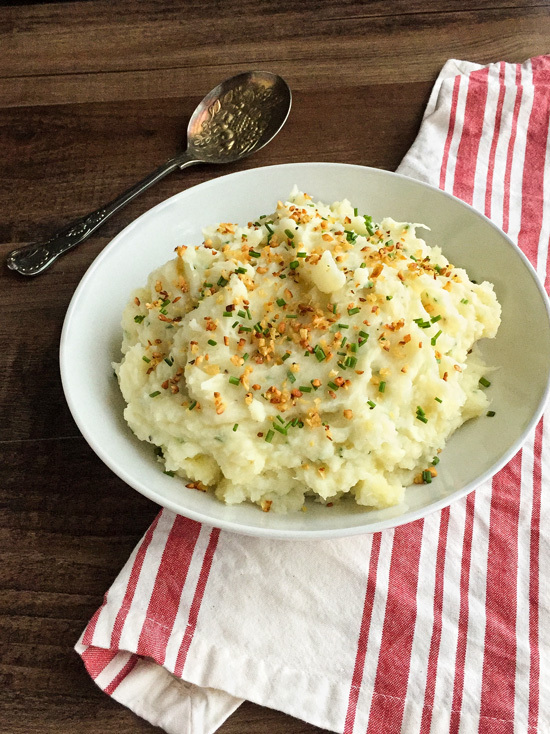 Mashed potatoes are a classic Thanksgiving side dish. They are also one of my favorite comfort foods. The parsnips add a hint of sweetness to the potatoes. The toasted garlic is an idea I got from an America’s Test Kitchen cookbook, and trust me, it’s worth taking the extra step to make it. The butter that the garlic is toasted in gets added to the potato and parsnip mixture. It adds a buttery, garlicky flavor that is utterly delicious. It’s just enough butter to satisfy your taste buds, without adding a crazy amount of fat like some mashed potato recipes. This makes enough to serve between four to five people. However, if you are having a small Thanksgiving for two, you can use the leftovers to make potato pancakes or waffles. Speaking of which, I just happen to have a potato waffle recipe coming your way very soon. I used up my leftovers by making those, and they are so flavorful and yummy! 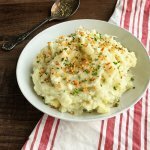 If you’ve never tried mashed parsnips with potatoes before, I suggest you give them a try. The hint of sweetness adds a little something different to your basic mashed potatoes. Oh, and that toasted garlic? Definitely, try that for sure! You’ll be happy you did! In a 4-quart soup pot or large sauce pan, add the potatoes and parsnips and cover with cold water one inch above vegetables. Bring to a boil, reduce heat to medium-low and simmer until potatoes and parsnips are tender (until a paring knife slips in and out of veggies easily), about 20 minutes. Meanwhile, melt the butter in a small saucepan over medium-low heat. Add the minced garlic, reduce heat to low and let cook, stirring often, until garlic begins to turn golden brown, about 12-14 minutes. Remove pan from heat and set aside for 5 minutes. The garlic will continue to brown. Pour mixture through a fine-mesh strainer into a small bowl and set aside toasted garlic. Also, heat the milk in a small pan over low heat. Drain the potatoes and parsnips in a colander. Place the potatoes and parsnips back into the pot and put back on the burner with the heat turned off. Using a potato masher, mash them until they are free of all lumps. Add the strained butter to the potato/parsnip mixture and mix until just incorporated . Add the warmed milk a little at a time and beat with a wooden spoon until you reach your desired consistency. Add salt, pepper and chives and gently stir to combine. Garnish with toasted garlic and serve immediately. Look for smaller parsnips. If the parsnips are really large, you will need to cut out the woody core before cooking. If using salted butter, you may want to adjust salt content. If using a potato ricer instead of hand mashing, leave the potatoes and parsnips in colander you drained them in, and working in batches, put them through the ricer back into the saucepan, then continue with recipe.